Located in the historic centre of the medina (KmO), next to the Kouba, this magnificent, luminous, spacious ryad was recently renovated for a traditional feel in a simple, sober, contemporary setting. The residence is decorated in subtle, refined colours and materials for a serene, relaxing atmosphere. In a magnificent courtyard of orange and palm trees, an aromatic garden surrounds the fountain. 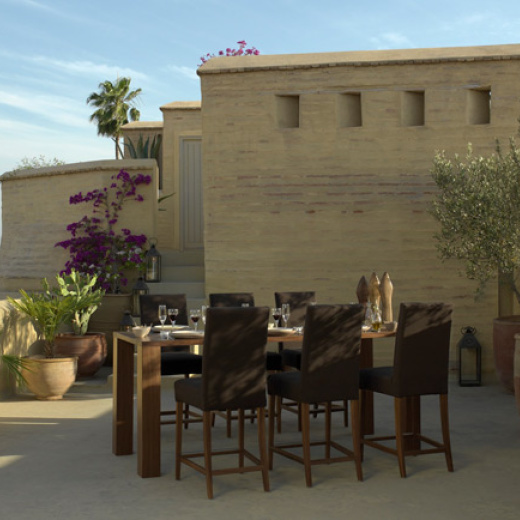 Broad terraces offer a 360° view of the medina and its menzeh (high tower) overlooking the museum of Marrakech, the Ben Youssef Medersa and the souks, with the Atlas mountains in the backdrop. All these features combine to make this an outstanding place.